Since I’ve been hung up on left-handed pitchers for a while, I thought I should end the year with one more lefty. 1. Richard William Marquard was born in Cleveland 9 October 1886. He was nicknamed “Rube” because his pitching (not his eccentric ways) reminded people of Rube Waddell. 2. He got his start in baseball working for the Telling Ice Cream Company as a deliveryman. During the week he delivered ice cream. On the weekends he delivered strikes for the company team. He also was a batboy for the Cleveland Naps (now the Indians) for a while. 3. In 1908 the Giants paid $11,000 for him (a huge sum at the time). For a return they got nine wins over the next three years. 4. He hit his stride in 1911 winning 24 games and leading the National League in strikeouts. 5. The Giants made the first of three consecutive appearances in the World Series that season, losing to the Athletics in six games. During the Series Frank Baker became “Home Run” Baker when he hit two crucial home runs. The first was off Marquard. For the three World Series’ Marquard’s record was 2-2 with 20 strikeouts and six walks. 6. In 1912 he put together a 19 game winning streak. New York won the pennant, Marquard won two games in the Series, but Boston won the championship. 7. His numbers slipped in 1913, ’14, and ’15. In late 1915 he was traded to Brooklyn, not long after tossing his only no-hitter. It was against Brooklyn. 8. In 1916 he was 13-6 with a 1.58 ERA (his career low), and 107 strikeouts to go with only 38 walks. Brooklyn won the pennant, but lost the World Series to Babe Ruth’s Red Sox. Marquard was 0-2 with a plus 5 ERA (He did not pitch against Ruth). 9. He won 19 games in 1917, lost 18 in 1918 and continued having up and down seasons for the rest of his career. He got into one last World Series in 1920 with Brooklyn, losing his only start (game one to Hall of Fame pitcher Stan Coveleski). For his postseason career he was 2-5 with an ERA in the threes. 10. Just prior to game four of the 1920 Series he was arrested by an undercover policeman for scalping tickets (he had box seats for the game). He was fined one dollar and court costs (the judge saying that the embarrassment should be enough punishment). Charles Ebbets took a dimmer view of the matter and traded Marquard to Cincinnati. 11. He had one last decent year at Cincinnatti, the was traded to Boston (the Braves) where he stayed until his retirement in 1925. 12. For a time he was married to Vaudeville actress Blossom Seeley, refered to at the time as “The Hottest Woman in New York”. 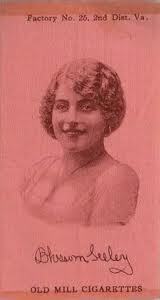 Here’s a tobacco card image of her (Actresses got trading cards too? Who knew?). You can judge “hot” for yourself. The marriage produced a child, but didn’t last. 13. He was elected to the Hall of Fame by the Veteran’s Committee in 1971 and died 1 June 1980. I began this somewhat long look at left-handed pitchers because I wanted to study the players who made an impact during World War II. That led, not unreasonably, to Hal Newhouser. He’s one of those players who had a lot of his best years during the Second World War and thus became known as “strictly a wartime pitcher”. The wartime pitcher idea goes something like this. A player is either new or has been up a few years and never done a thing. Then the war comes along and the guy becomes a star. The war ends, the real players come back, and the guy goes back to being a bum. OK, that’s fine, I guess. The problem is that it’s wrong about Newhouser. Newhouser arrives in Detroit in 1939. He was 18, a year older than Bob Feller and a year younger than Sandy Koufax (two pitchers he’s very much like) when they first pitched in the Majors. He wasn’t all that good, struggling through 1943 with a record of 34-52 with a high ERA, a lot of strikeouts, and a ton of walks (leading the league in walks in 1943). Then in 1944 he goes 29-9 with a 2.22 ERA, a strikeout title, and the American League MVP award. In 1945 he’s 25-9, leads the AL in ERA, strikeouts, shutouts (and wild pitches), and picks up his second consecutive MVP Award (the only pitcher to win two in a row). Detroit goes to the World Series and wins in seven games (by this point the Series is most famous as the last Series the Cubs played). Newhouser went 2-1, winning game seven. And then the war was over and “strictly a wartime pitcher” is supposed to have gone back into obscurity. The problem is that Newhouser had four or five (depending how you look at 1950) more good years. He wins 20 or more games twice, wins another ERA title, and as late as 1949 has 18 wins. He also leads in hits once and wild pitches twice (Like Feller, he never did get the wildness totally under control). In 1946 he came in second in the MVP vote (to Ted Williams), missing winning three MVPs in a row by 27 points). He hurt his shoulder in 1949, pitched through the pain in 1950, then the wheels came off as the shoulder just didn’t improve. He hung on into 1955, getting into the 1954 World Series as a Cleveland reliever (he was 7-2 with 7 saves, but awful in the Series), then retired. He made the Hall of Fame in 1992. What people tend to concentrate on his 1944-45 years, the “war pitcher years”. The argument goes that the real players left and Newhouser feasted on fake hitting. And I suppose it’s fair to say that the number of true Major League quality players in 1944 was down considerably from a normal season. But take a look at 1945. By the end of ’45, many of the “real” players were back. Hank Greenberg, a teammate, was back in time to hit the home run that sent Detroit to the World Series and Feller pitched nine games. Newhouser didn’t lose all nine games late nor did he win all 25 early. But the real problem with evaluating Newhouser as a “wartime pitcher” is 1946 through 1949. In 1946 he won 26 games, had his ERA go up all the way to 1.94 from 1.81 and his ERA+ drop from 195 to 190, and for the only time in his career led the AL in WHIP. Not a bad year for a “wartime pitcher”, right? It was his peak and 47-49 were not as good, although not bad either. He’s 55-40 over the three years (at 17-17, 1947 is the worst year record-wise) and his ERA starts sliding back up, but it’s not like he’s awful. So why the jump in stats in 1944? Well, a couple of reasons. First, there’s no denying the quality of play is down in 1944. But Newhouser is also now aged 23 with five years experience in the Majors. It’s time for him to begin reaching a something of a peak. And that peak lasts until he is 28 or 29 (depending on your view of 1950). Then the sore shoulder hits. He’s not much from 30 on (remember Koufax was 30 when he retired). Actually, it’s a fairly normal career progression tempered by both the war and the shoulder. Yeah, I know, the title’s a little dramatic, but what the heck. If you’ve been following closely (and you should) you’ll note I’ve gotten through nine on my way to the 10 top left-handers in the Major Leagues. I began this by complaining that depth among left-handed starters is almost nonexistent. Trying to find 10 who were really top of the line is difficult and the search for the 10th is the hardest. I went at this the way I normally do, I put down a preliminary list, looked it over, decided it was wrong, then began to research. That’s where I found an interesting problem developing among southpaws. There really is not true consensus about the top 10. I looked at traditional stats, I looked at the new SABR-type stats and realized you can pick your guy based on which stat you like. Pick a stat and when you run through the nine I’ve already looked over, you get all sorts of different picks. I looked at a bunch of SABR-style stats, but will only bore you to tears with three of them for this post. First, I’ll give the stat, then the top five left-handers on that stat’s list that aren’t the nine guys I’ve already done. Notice the differences (all active players in parens). Notice something interesting? The only names that repeat are Waddell, Newhouser, and Santana, with Santana still being active and liable to rise or fall depending on what happens with the rest of his career. Not much consensus is there? A couple of these guys (Russell and Morris) I’d never heard of, so I looked them up and that led to the disqualification of Morris. It’s also interesting to note who isn’t there. Hall of Fame pitchers like Lefty Gomez, Rube Marquard, Eppa Rixey, and Herb Pennock are missing. Other stats do the same kinds of things. There seems to be something of a belief, at least statistically, that Waddell and Newhouser are the best of the old timers (Old timers? Newhouser pitched his last few years in my lifetime. Yikes.) and that Santana is the best of the current lot. OK, I guess. But how impressed are you really at that list? Nice group of pitchers, but are there really only nine guys better in 150 years of the Major Leagues? If so, then the crop of southpaw hurlers is as weak as I thought. OK, to wrap it up, which one do I add to my list? Tentatively I pick Newhouser and reserve the right to drop him depending on the rest of Santana’s career. Continuing in the vein of the last post, here’s some thoughts on three more left-handed pitchers. They are listed in the order they arrived in the Major Leagues. No implication of order in a list of 10 or 20 or 3 is implied. 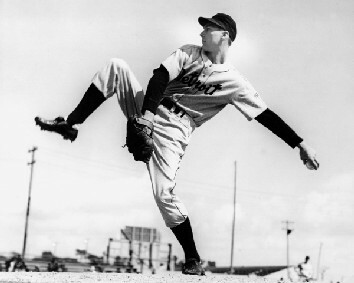 Carl Hubbell–rates as the National League’s finest pitcher of the 1930s and with the possible exception of Lefty Grove is the best pitcher in the big leagues. 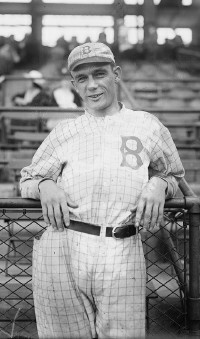 Hubbell played 16 seasons, all with the Giants and led the team to three pennants and the 1933 World Series championship (over Washington). He won 20 or more games five years in a row, 17 or more three more times, won three ERA titles, a shutout title, led the NL in strikeouts once, and his ERA+ peaked at 195 in 1933. He’s also famous for winning a season’s worth of games in a row and striking out the first five men in an All Star game. His winning percentage is .622 and his ERA is 2.98 which is terrific for the 1920s and 1930s. His overall record is 253-154 and then there’s that MVP trophy for both 1933 and 1936 making him one of three pitchers to win multiple MVP awards. Walter Johnson won both a Chalmers Award and a League Award, early versions of the modern MVP. Hal Newhouser is the other pitcher to win multiple MVP awards (back to back in 1944 and ’45). Hubbell’s great pitch was the screwball and according to legend he threw it so much the palm of his hand turned to face outward when he walked. Over the years he’s lost some of his luster. A couple of reasons for that. First, it was a long time ago and secondly he never got to 300 wins. I also think it matters that the Giants have moved to San Francisco. There seems to be a disconnect between the New York and Frisco versions of the Giants that is different from the Los Angeles and Brooklyn versions of the Dodgers. The LA Dodgers seems to embrace the Brooklyn team, the Giants not so much (Giants fans might disagree but that’s how it seems to me). Whitey Ford–among pitchers with 110 wins or more who pitched from a mound, Ford has the highest winning percentage at .690. He got to New York in 1950, became the youngest man to win a World Series game at age 21 (don’t know if that’s still true), went to the military for Korea, then came back and was the major pitching force for the late 1950s and early 1960s Yankees. He won 236 games, lost 106 and put up an ERA of 2.75 over a 16 year career (the same number of years as Hubbell). The Yankees through that entire period had at best a mediocre pitching staff. One year Johnny Kucks had a good years, the next season it was Don Larsen, another it was Bob Turley or Art Ditmar. What they had was Ford. He gave them good years for most of the period and in World Series play went 10-8 with four of the losses coming in his last three Series’. He broke Babe Ruth’s record for consecutive scoreless innings in World Series play. And somehow he’s gotten overlooked in the grand scheme of things. I think because he pitched in a hitters era and his team was primarily known as a hitting team, Ford falls through the cracks. He wasn’t quotable like Berra, or charismatic like Mantle or DiMaggio. He was, however, a heck of a pitcher. Sandy Koufax–there is absolutely nothing obscure about Koufax. He still maintains his hold on the American imagination although he hasn’t pitched in 45 years. For those of us who saw him we understand why. He simply was the best I ever saw. In his prime he was better than Seaver (and Seaver is probably the best right-hander I ever saw), better than Clemons (with our without steroids), better than Palmer (although Koufax lost his last game to Palmer). “They” say a curve ball doesn’t really curve. “They” never faced Koufax. His record was 165-87 for a .655 winning percentage (129-47 and .733 over his last six seasons). He led the National League in wins three times, in ERA five, in strikeouts four, and his 382 whiffs in 1965 was a record (and it’s still second to Nolan Ryan’s 383). He led the league in shutouts three times, in WHIP four, and won the 1963 MVP Award. He also has one of my favorite stat sets: 2324.1 innings pitched and 2396 strikeouts. Not many pitchers with 1000 innings pitched have more strikeouts than innings pitched. Randy Johnson, Pedro Martinez, Nolan Ryan, and Oliver Perez did as do current pitchers Tim Lincecum and Kerry Wood. Among relievers only Trevor Hoffman did. In his first six years he was wild, but never walked more than he struck out (although it’s close a couple of years). He was a “bonus baby”, which meant he had to spend his first two years in the Majors without benefit of Minor League experience. It showed. He was a member of four Dodgers World Series winners, although is contribution to the 1955 win was negligible. He ended up with arthritis and retired at 30 after a year in which he won 27 games. And I think that’s also a great deal of his mystique. We never saw a worn out, tired, over the hill Koufax whose curve didn’t and whose fastball wasn’t. So there is always a “what did we miss?” quality about him and an awe at what we did see. Add these three to the six 300 game winners and you easily have a top nine of left-handers. That still leaves one more for ten. Another post for another day. In a comment on my previous post, Bill asked for my list of the 10 best southpaws. I’m going to do something like that, but not actually list them 1 through 10. I want to use this post to make a couple of comments about the six left-handers who won 300 or more games. Later I’ll look at a few that didn’t. Warren Spahn–maybe the most consistent pitcher ever, right or left. Between 1949 and 1963 he won less than 20 games three times (1952, ’55, and ’62). He’s 42 when he wins 23 in 1963. It tied his career high. Overall he won 363 games, never more than 23 in a season. If you’re a manager, don’t you love that number? For 15 years you can pencil in 21 wins from your ace without worrying about it. His highest ERA over the period was 3.26 ( in ’55, one of the years he doesn’t get to 20 wins), his lowest was 2.10 in 1953. the 3.26 is actually closer to his normal than the 2.10, but that’s still pretty good in the high scoring era that is the 1950s. Every year he had more innings pitched than hits, and led the National League in strikeouts four times. His ERA+ hovered around 120 for most of the period, peaking at 188 in 1953. Steve Carlton–seems to have gotten lost over the years. For years he and Nolan Ryan were in a race to record more strikeouts than anyone else. Carlton got there first, but Ryan eventually blew by him (and everyone else). Carlton won 329 games, but unlike Spahn, won them in bunches then had periods where he didn’t do so well. His 1972 is one of those years that people still mention, and frequently is the only time he is mentioned. He won 27 games, his team won 59. He led the Nl in wins four times, in strikeouts five, and in ERA and shutouts both once. While still at St. Louis he set a record for most strikeouts in a game. Late in his career he becomes a nomad and isn’t very good. 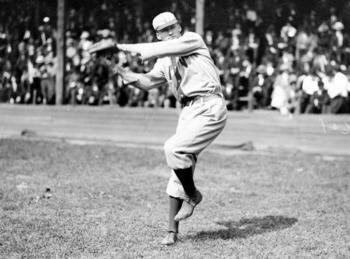 Eddie Plank–easily the most obscure of the 300 win lefties. His career began in 1901 and ended in 1917. To give you some perspective, he was pitching 100 years ago. For years, until Spahn came along, Plank was the winningest left-hander ever. He spent time in the Federal League (1915) and that makes his win total in dispute. Some sites don’t recognize the Feds or Plank’s numbers, others do. He ended up with 326 wins (305 if you leave out the Feds), a .627 winning percentage, 69 shutouts (leading the American League twice), and played on three World Series winners. He never led the AL (or the Feds) in wins, ERA, or strikeouts. The knock on him seems to be that Connie Mack never considered Plank his ace. That appears to be true of the secondset of World Series years (1911-14), but Plank’s best years are the period 1902-06. The A’s win a pennant in 1902 (no World Series) and lose the Series in 1905. Plank doesn’t get to play for the great A’s teams until he’s beyond his prime. He’s 2-5 in Series play and does not pitch at all in the 1910 World Series victory. Tom Glavine–the two pitcher on the great Braves staffs of the 1990s (behind Maddux). I think that hurts him a lot in much the same way that Drysdale gets hurt by being in Koufax’s shadow (not trying to compare Glavine and Drysdale directly). Glavine has a Cy Young (actually two), Maddux four. Glavine does have a World Series MVP trophy and pitched a magnificent game six in the 1995 World Series. It seems to be forgotten that he’s the ace of that 1991 Braves team that goes from last place to the World Series (and a Jack Morris masterpiece short of the championship). Overall he’s 305-203 for a .600 winning percentage. He led the NL in wins five times and in shutouts once. He was a good pitcher, but I think gets lost in the shuffle behind Maddux, as stated above, and behind the guy listed just below him in the wins column. Randy Johnson–it’s kind of tough to say who is really the greatest left-hander ever, but a pretty good case could be made for Johnson. His record is 303-166 for a winning percentage of .646. My guess is a lot of people don’t realize his winning percentage is that high. He’s second in strikeouts (behind Ryan), his strikeouts to innings pitched ratio is Koufaxian (is that a word? ), he won the strikeout title nine times, four years in a row going over 300 k’s (with two more 300+ k seasons earlier). He has a World Series ring, winning three games in the process (but is only 7-9 overall in postseason play). He wins 20 games three times, leads in ERA in winning percentage four times each, in shutouts twice, and early on walked a ton of batters. He got that last under control early and his walk to strikeout ratio is great after the first few years. He also had that easy sidearm delivery that seems to have been relatively easy on the arm and scared left-handed hitters to death. There was another Johnson whose delivery reminds me much of Randy’s. His name was Walter and he was pretty good too. Lefty Grove–there is a school of thought that Grove is the greatest pitcher ever. I’m not in that school, but he was really good. He played in the 1920s and 1930s, huge hitting eras, and was easily the best left-hander in the American League in perhaps in all baseball (Carl Hubbell being his only competition). For his career he ended up 300-141 for a winning percentage of .680 which is darned close to the best ever by a left-hander (Whitey Ford’s is better) and is astonishing in the era he pitched. His ERA is 3.06, again a terrific number for the age and his 2.54 ERA in the inflated year of 1930 is one of the great feats ever by a pitcher (and almost totally overlooked today). He led the AL in ERA nine times, in strikeouts seven (all in a row), in shutouts three times, and his ERA+ in 1931 was 220. In ’31 he won 31 games (don’t you just love 31 in 31?) and lost four. He appeared in three straight World Series’ going 4-2 with his team winning the first two (1929 and 1930. The loss was 1931). He ended up at Boston where he hung on long enough for 300 wins and except for his last two years (1940-41) was pretty good even then. So there are the left-handers who won 300 games. If I were doing a top 10, all would be on the list, although not in the order listed above. I don’t know how you classify ball players, but I tend to lump them into five categories: great, good, OK, not so good, and yuck. Most players who get more than a cup of coffee in the Major Leagues tend to clump in the OK and not so good categories with a sprinkling into each of the others. That’s really true of left-handed pitchers. Did you ever notice how few truly fine left-handers there are? Do me a favor. Stop reading for a moment and sit down and try to write out your top 10 or 15 or 20 (at your discretion) southpaws. Now take a look at it closely. Notice how few truly great pitchers are on that list. Not a lot, right? I did that the other day while sketching out a different post and was shocked at how quickly I ran out of first-rate pitchers. Do it with right-handers and you go a lot longer on the list before you start getting into the good and OK categories. And for the record I’m talking about starters, not relievers or set up men. But in both cases, the number of first-rate lefties is really small. Now obviously that has to do with the fact that only about 11% of the population is left-handed. But it still seems to me to be quite a small crew (less than 11% of pitchers) who can step out as top of the line lefties. I’m not so sure why that is. Maybe it’s just the small sample size (is that great alliteration or what?) that makes the difference. So I’ve decided to advise my son to teach my grandson to throw left-handed. OK, the kid’s right-handed, but it’s not too late to teach him to throw with the other hand (he’s only six). Heck, there’s the potential for a lot a money and for a place among the elite of southpaws. Go ahead, son, give it a try. Do it for the old man. Way back when the 20th Century ended, the SABR people got together and picked the most significant contributors to Baseball in the 19th Century. Henry Chadwick won, there was a tie between Harry Wright and Albert G. Spalding for second. I’m not sure I’d place Chadwick above Wright and Spalding, but it’s a matter of taste. There’s certainly no argument that Spalding was a major contributor to the origins of Major League Baseball. He owned the Chicago White Stockings (now the Cubs), promoted a 19th Century around-the-world tour to tout baseball, founded a major sporting goods company that bore his name, was instrumental in forming and promoting the Abner Doubleday myth (OK, so not everything he did was positive), led the attack that crushed the Brotherhood union (see what I mean about not everything being positive), and finally made the Hall of Fame. But that’s not what I want to dwell on. Spalding was also a heck of a ball player. Spalding was an early amateur and later professional who caught the eye of Harry Wright. 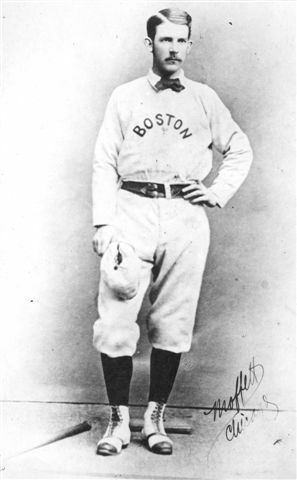 In 1871, the National Association of Professional Base Ball Players was formed and Wright took over as manager of the Boston team. He convinced Spaulding to come on board as the team’s pitcher. It was a great choice, because Spalding became the premier pitcher in the Association and dominated the league in a way that no other pitcher has ever duplicated. In the five years the Association existed, Spalding pitched in 282 games, starting 264. His record? How about 204-53 for a winning percentage of .794? Now this was an era when there was only one pitcher and he threw from 45 feet away, but those are still astounding numbers. In the five years of the Association Spaulding won, in order, 19, 38, 41, 52, and 54 games. He lost, again in order, 10, 8, 14, 16, and 5. Read that last pair closely. In 1875, Spaulding went 54-5 (.915 winning percentage). There are some caveats here. His team, the Red Stockings, were a lot better than their competitors and the number of games played by the team increased every year. But part of the reason the team was a lot better than everyone else is because they had Spalding and no one else did. His ERA for the five seasons was 2.21 (ERA+ of 131). He struck out only 207 men in the five seasons, topping out at 75 in 1875. But the pitching rules were different then and there simply weren’t a lot of strikeouts. He has one of my favorite set of numbers that, to me, help illustrate just how different 1870s baseball was from the modern game. For the life of the Association he gave up 1552 runs, only 577 earned (37%). That means a lot of guys were hitting the ball off him, and a lot of his teammates weren’t catching them. As a hitter he averaged .323 with an OPS of .721 (OPS+ of 121). He pitched one complete season in the newly formed National League (1876). He went 47-12 for the White Stockings (Cubs), had an ERA of 1.75 (ERA+ of 140), completed 53 of 60 starts, plus one relief job (he didn’t get the save), had eight shutouts (which was tough in 1876), and the Cubs won the first NL pennant (wonder if the Cubs could use Spalding today?). The next season he appeared in four games, started one, won it, picked up a save, but spent most of the season as the first baseman. In 1878 he played one game at second base, became club secretary, then he took his money and bought the club and went on to glory (or infamy if you were a Brotherhood fan). Spalding is one of those guys that it’s difficult to like. He was cold, aristocratic, tough-minded, and in the minds of many of his players a tough SOB. But he was, despite all that, one great pitcher. There’s something very sad about the end of a Major Leaguer’s career. Most of them leave under bad circumstances. They get hurt, they weren’t good enough, or age finally took its toll. The last one happens to all of us. And it happened to Walter Johnson in 1927. The 1927 season is most famous for Babe Ruth’s 60 home runs and the Murderer’s Row Yankees. But it was also Walter Johnson’s final campaign. His Senators placed third in the league but for a change it wasn’t because Johnson had a fine year. For the season he pitched in only 18 games, starting 15, his lowest total of both since his rookie season in 1907 (actually the number of starts tied a low in 1920, a year he was hurt). He won five games that season, the last a 12-2 romp over the White Sox on 28 July. In that game he gave up one earned run, walked three, struck out one, gave up six hits, scored a run, and had two singles. He would lose two games after 28 July and end the season with a 5-6 record. For the season he pitched 107.2 innings, gave up 113 hits, walked 36, struck out 48 (his lowest career total, including his rookie season and his 1920 injury season). His ERA was 5.10, the only time it was above 3.75 in his career. But even in his final season, Johnson helped his team. He did it with his bat. He pinch hit in eight contests, had two home runs, two doubles, ten RBIs, and hit .348 with a slugging percentage of .522 and an OBP of .388. (OPS of 910). Not bad for a pitcher, right? His last appearance was in one of the most famous games of the season, 30 September. The Senators played the Yankees in Yankee Stadium. With the score tied 2-2 in the bottom of the eighth, Babe Ruth slugged a two run homer, his 60th of the season, and the game winner. In the top of the ninth, Johnson pinch hit for pitcher Tom Zachary, made an out, and saw his career come to a close. It wasn’t a bad year exactly, a lot of players have worse seasons, but it certainly wasn’t a Walter Johnson season. He retired after the campaign, managed a little (I did a post on him earlier, look it up), and was in the first Hall of Fame class. I look at those numbers and am glad I didn’t see him that year. It’s always kind of sad to see a truly great player, arguably the greatest pitcher ever, face the end. You get nostalgic for when you remember how good he was and wonder why he hung on so long. I know the answer to that at least. If I had been able to play in the big leagues, I certainly would have hung on for every single inning I could get. So I don’t blame guys like Johnson, but I can’t help feeling a little sorry whenever I see it. It seems that baseball’s award season isn’t really over as I suggested a week or so ago that it might be. Saw that they just gave the Ford Frick Award to Tim McCarver. This is the award for excellence in broadcasting (sort of a counterpoint to the Spink Award for writers). The list is posted in the Hall of Fame, so in one sense McCarver finally made the Hall of Fame. I’m of two minds about McCarver as a broadcaster. I remember when he was good, really good. He brought fresh commentary, new ideas, a new sense of how the game was played to the color guy spot in the booth. I learned a lot about some of the inside on-field stuff from him. I remember him saying “the manager will send him here” and the manager sent the guy and other stuff like that. I loved his stories, especially the Bob Gibson tales (there were almost none about Steve Carlton, which sort of figures). But by now the act is getting old. I’ve heard all the stories a dozen times. In McCarver’s defense my wife has heard all mine at least that many times and probably more. He’s not as accurate as he used to be and he has trouble with getting the right words sometimes. I know the feeling, so I’ll give him a break on it. But maybe this should be the capstone of his career and he should ride off into the sunset (do color guys do that?) and enjoy a well-earned retirement. 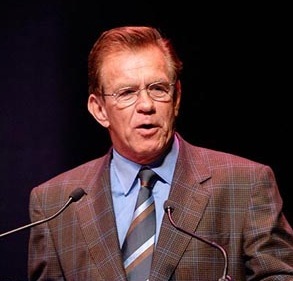 Whatever he does, congratulations to Tim McCarver for winning the Frick Award. My favorite McCarver story about Gibson goes like this. Red Schoendienst, Cardinals manager, ordered an intentional walk. Gibson plunked the guy with the first pitch. McCarver goes out to the mound and asks what the heck was that all about? Gibson replies, “I just saved three pitches.” Don’t know that I believe all the stories, but that one I believe. Sunday I posted the names that appear on the 2012 Hall of Fame ballot. This is the group that will be voted on by the Baseball Writer’s group. They are supposed to be knowledgable and frequently aren’t. So in order to help them along, and there are years they need all the help they can get, I thought I’d let them and you know exactly who I think should be on their ballot. They can vote for up to 10 players, but may vote for none if they so desire (and all blank ballots should be thrown out and not counted for purposes of getting to 75% of the vote-the magic number for election). That being the case, I have an old rule; if they’re going to give me 10 votes, I’m going to take them (sure works in political elections, doesn’t it?). Here, then, are the 10 guys I’d vote for off the 2012 ballot (alphabetically). Jeff Bagwell-one of the better first basemen of recent years. Had a lot of good years and one great one (and picked up the MVP). His team got to one World Series (and lost) when he was well on the downside of his career. Didn’t hit 500 home runs, but did hit 449. It’s the steroid question that is supposed to have hurt him last year, but he has no record of use nor is there rampant speculation that he used any, so I can’t see why that’s really a problem. Arguably best player in Astros history (behind maybe Ryan and Biggio). Barry Larkin-consensus seems to be that this is his year. I sure hope so. Heck of a player, good team leader. Won an MVP he probably didn’t deserve, but might have won another. Winner of one championship. Edgar Martinez-There’s a reason the DH award is named for him. Best DH ever (with apologies to Paul Molitor). Got to the Majors late but played an adequate Third Base until he got hurt. Then became a career DH. Won three batting titles Sorry, team, you just can’t leave out a player because he only did one thing well. If you do then every pitcher not named Ruth has got to go as well as a lot of hitters like Ted Williams who also only did one thing well. Don Mattingly-A personal favorite, although I never liked the Yankees. He’s kind of the anti-Sandy Koufax. Koufax had some less than stellar early years then became great, Mattingly went the other way. Great player before he got hurt, and I think great enough to make the Hall. Jack Morris-arguably the best starter not in the Hall of Fame and eligible (feel free to disagree). Won a lot of games, ace of three teams that win the World Series, 4-2 in World Series play. His problem is a huge ERA. Sorry, but I don’t think that’s a disqualifier. A lot of those runs were given up in garbage innings after the game was decided. Dale Murphy-Bill Miller at “The On Deck Circle” just made a good case for Murphy. Go there, check it out, and I’ll let it speak for me. Tim Raines-mostly known for his stolen bases, but could hit a bunch (including one batting title). I think the last few years of his career (his “nomad phase”) hurts him a lot, but still productive realatively late. Alan Trammel-another of the people “The On Deck Circle” just touted. OK, I’m being lazy, but he did a good job and you should read it. I’m afraid Trammel’s years managing Detroit is going to hurt him, but this is supposed to be about his playing skill, not his managing acumen. Came close to one MVP award and won the 1984 World Series MVP. Larry Walker-Yeah, I know he played in Coors Field, but he also hit a ton at Montreal and even with St. Louis right at the end of his career. Also has an MVP award, a home run title, two batting titles, a couple of slugging titles, and had one of the best outfield arms I ever saw. Bernie Williams/Fred McGriff-I’m very torn over which of these to include. Williams led his team to four World Series titles (and a couple of losses), won a batting title, and was good enough to hit clean up for those World Series winning teams. Also a good outfielder. McGriff was a power hitting first baseman that the steroid era has made look better (sort of like happened with Andre Dawson). With no hint of steroids (take a look at him–if he was using them, they weren’t working) he almost had 500 home runs. He won one World Series title and a couple of home run titles (one with the lowest homer total in the National League in a non-strike year since 1946-35 in 1992). Frankly, I used to think he didn’t deserve the Hall, then the steroids allegations started and suddenly he looks a whole lot better. I only get one, so I’m going with Williams, but I really miss putting McGriff on the list. As to the others, if I had a lot more votes I’d give Vinny Castilla, Brian Jordan, Bill Mueller, Brad Radke, and Tim Salmon one. Not sure I think any of them ar Hall of Famers, but I liked them all, I’d like to see them stay on the ballot for a few more years so that better evaluations can be made of their careers, and I think we ought to take a moment and thank them for their contributions to a game we all love. In some ways, that’s what having 10 votes does anyway. You are currently browsing the Verdun2's Blog blog archives for December, 2011.